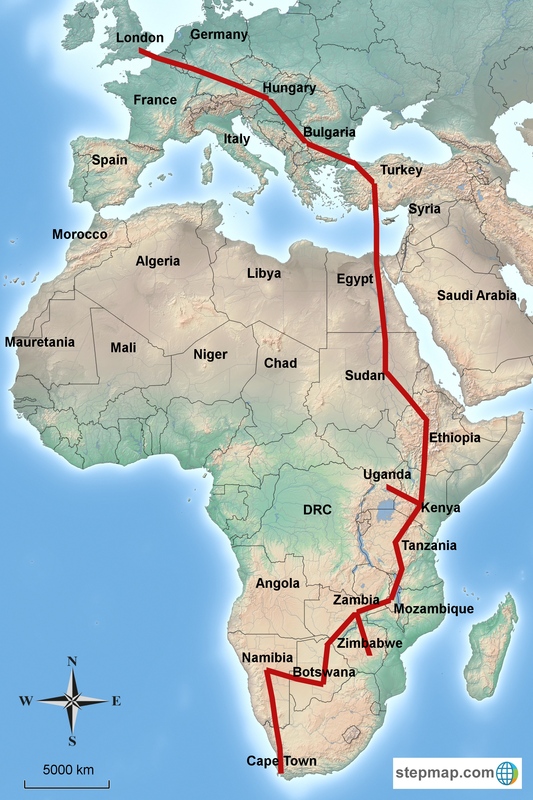 There are several routes from the U.K. to Cape Town predominantly divided into East and West. The Western option involves getting the ferry to Morocco, moving through Mauritania and into West Africa. The old stomping ground of the Dakar rally has been notoriously unstable particularly since French intervention in Mali, with the next major hurdle being the sinister Boko-Haram in Nigeria and ultimately “The Heart of Darkness” home of the fictitious Kurtz. The existence of these risks among many others left us to consider East Africa where risk existed but looked a lot less insurmountable. Accessing North East Africa can be done by ferry to Tunisia and then overland through North Africa to Egypt, but with the poor security situation in Libya this option was quickly written off. Similarly driving through Syria, Palestine and Israel was deemed a no-go due to the ongoing conflict in Syria and that Israeli passport stamps prevent access to Sudan. Since the conflict in Syria a ferry service has opened to allow trucks safe passage to Egypt and Saudi Arabia, which was to be our gateway. So the plan is to drive from London through Europe to Turkey where we will taking this ferry to Egypt. However, with the situation in Egypt fast deteriorating we are exploring alternative routes to circumnavigate the trouble. From Egypt we would aim to head into Sudan, avoiding the volatile southern regions, then climbing into Gondar and the Ethiopian highlands. Thereafter following the great rift valley south towards Kenya, briefly deviating into Uganda, before continuing south to Lake Malawi and Zambia. After a short detour into Zimbabwe, we return to Zambia and make for Botswana and the skeleton coast. Finally dropping through the rest of Namibia, into South Africa and eventually making Cape Town.